Two days ago (ed. Sept 30, 2015), the Houston Chronicle headlined a story, “Lost Photo of Jesse James, assassin Robert Ford is found. Authenticated. ” Here we go again, I thought. Another day. Another fake Jesse James photo. Another fake authentication. Another con artist, or two, or maybe more. 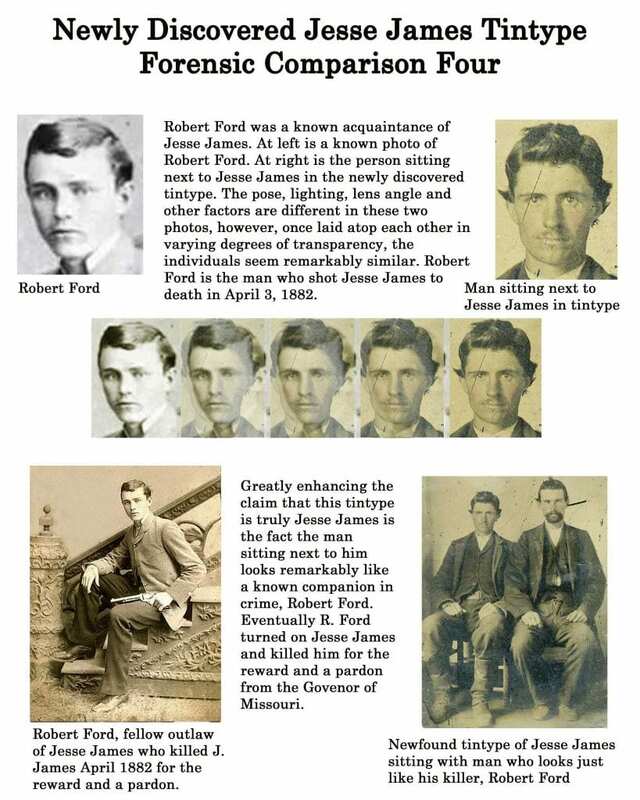 The fact is, there are no photos of Jesse James or Bob Ford that are lost. Moreover, the ones claimed by the Chronicle are not authenticated. Here is why. 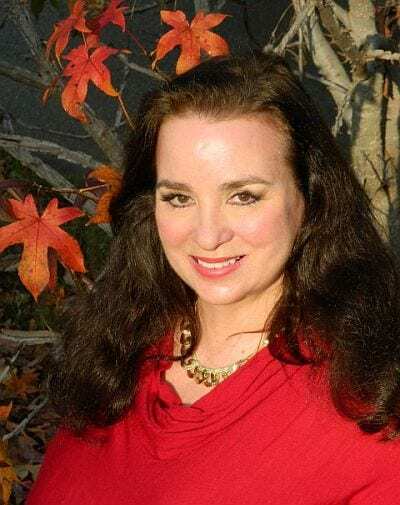 According to the Guinness Book of Records, Lois Gibson holds the world record for “most successful forensic artist.” Gibson is the chief forensic artist for the Houston Police Department. In my experience as genealogist and historian of the Jesse James family, Texas is the birthplace of numerous Jesse James hoaxes. Some have carried on for decades. 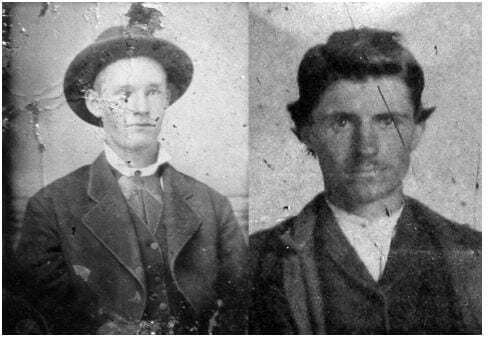 Apparently, with three images of Jesse James, Robert Ford, and Zee Mimms-James, which Gibson claims to have authenticated, the 65-year-old Lois Gibson is an artist with a leg up on creating another Jesse James hoax in Texas. Let us back up on Gibson’s story to my first encounter with Sandy Mills. Sandy is the owner of the image in question. Gibson claims this image was lost, now found, and she has authenticated it. 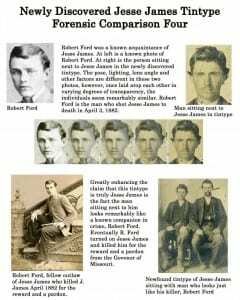 As happens with regularity in most any month here at Stray Leaves, images of all types believed to relate to the Jesse James family are submitted here for review, and opinion. 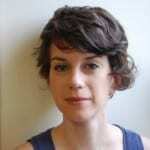 Mills submitted her image to me for review in March of 2013. Mills stated, “I have a tin type photo of Jesse James sitting with another man, we think it is a first cousin Robert Woodson Hite. We are interested in showing you. Please contact me.” The email from Mills arrived under enhanced suspicion. Mills sent the email under an alias email account of Robyn Anderson. Con artists love alias names. Red flags were waving already. In 2002, Jesse’s great-grandson, Judge James Randall Ross, and I founded the James Preservation Trust. 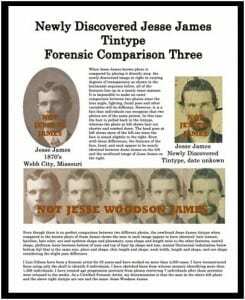 Part of the mission of JPT is to archive the family history, as well as to address issues about the veracity of Jesse James family history, genealogy, images, and documents. Upon receipt of a claimed image, the image is circulated first for preliminary review among family, respected historians, and/or specific authorities most relevant to the image’s provenance. 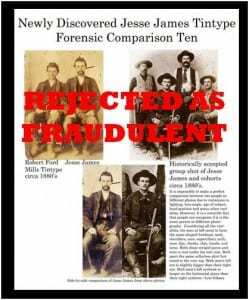 If the image is believed to be possibly verifiable as authentic, the image owner is referred for full forensic investigation and analysis to a reputable authority fully trained in the metrics of scientific forensic analysis and Jesse James history. The image owner then can chose to employ, or not to employ, such services. 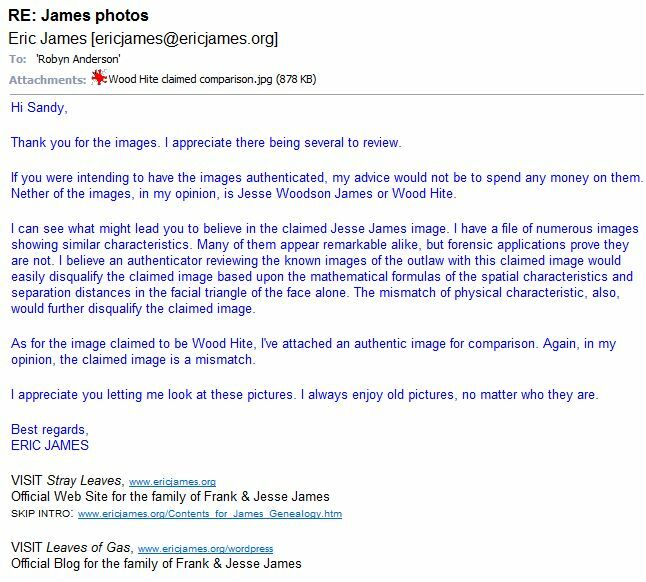 The image Sandy Mills provided me was so blatantly false about being either Jesse James or Woot Hite, I told Mills not to waste any money for an authentication. There exist only a handful of authentic images of the outlaw Jesse James. Those images appear variously on Stray Leaves and have done so for nearly 20 years. I also included an authentic image of Woot Hite from the Joan Beamis Archive for Mills to compare with her claimed image. Actual image of Robert Woodson Hite (L) from the James Preservation Trust, compared to the claimed image (R). Wood, or Woot as he was called, is a James descendant. His mother is Nancy Gardner James, an aunt of Jesse Woodson James. Wood Hite displays the same genetic physical characteristics that are common to Jesse James and other members of the James family. Under the alias of Robyn Anderson, Sandy Mills submits a claim to Eric F. James, the historian and archivist for the family of Frank & Jesse James. Mills claims the image is Jesse James and "another man." Eric F. James replies, offering to review and comment on the image. Again, under the alias of Robyn Anderson, Mills submits her photo image to James. Mills now identifies "another man" to be Wood Hite, a cousin of Jesse James. James acknowledges receipt of Mills' images. He states neither of the image subjects is Jesse Woodson James or Wood Hite. He attaches an authentic image of Hite for comparison. The Houston Chronicle article now links Sandy Mills with Lois Gibson. This raises many questions and more red flags. Who is conning whom? Did Mills inform Gibson of my reaction to the image? Did Mills offer other information to Gibson that Mills did not offer to me? On the other hand, did Gibson see another opportunity for self-promotion, as Gibson formerly did when she stated a tintype image of Billy the Kid was the authentic tintype of the widely circulated image of the Kid already known to be authentic. At that time, Gibson fell under intense scrutiny. She was widely derided among the western artifact collector community, another red flag. 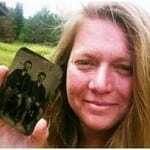 Regardless of what remains unknown about the relationship between Mills and Gibson, what is known is that the images Lois Gibson states are authentically Jesse James, Robert Ford, and Zee Mimms-James cannot be authenticated as true when, in fact, they are fake. Customarily, a reputable authentication of any historical image is documented in abundant clinical detail in an image’s authentication report. The report usually bears the signature of a witness or witnesses, and/or a notary for formal and legal recognition. Gibson provides none – a red flag. The report will give a full account of the credentials of the expert performing the authentication, a full explanation of the scientific techniques applied, the entire known provenance of the image and its condition. Gibson pretends to do so, but provides none – another red flag. The report concludes with arguments and resulting findings, which the applied forensic analysis produced. No evidence exists that Lois Gibson performed any scientific authentication of image assessment, or that she is qualified to do so. In her biographical statement, Gibson says she is a forensic artist. At first glance, her record as an artist is impressive. She claims no forensic science training, though – a significant red flag. What Lois Gibson has proudly produced from her palette of artist tricks is a deception intended to fool the eye of the indiscriminate viewer and a public un-knowledgeable about Jesse James. Gibson’s deft artwork is intended to convince you she has authenticated the subject image when fact it does not – an additional red flag. Gibson’s cardinal sin was first to alter the image to her preference by a process of image reversal. Lois Gibson reverses the images presented to me in 2013 by Sandy Mills. In the field of legal evidence, this is termed “tampering,” – a most compelling red flag. In a series of plates Gibson next manufactures and develops her suppositions with no reference to actual history that is known or recognized. In Plate 1, Gibson describes the spare provenance provided by Sandy Mills. 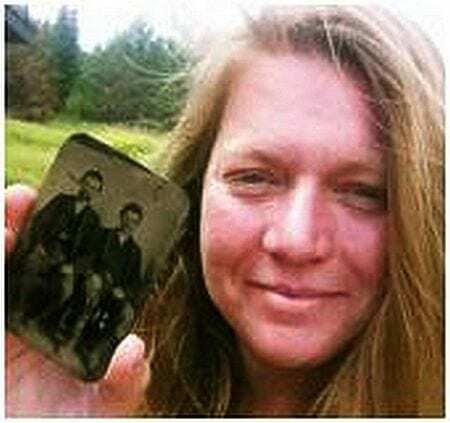 Neither one addresses Mills own genealogy or the personal family background or circumstances that might offer the slightest explanation for how this image fell into the Mills family’s possession. Gibson proceeds to compare Mills’ image to the authentic wedding photo of Jesse James. Mills’ fake Jesse James is cross-eyed, something Jesse was not. Although Jesse suffered from “lazy eye” in his youth, the condition corrected itself by his adulthood. Mills references no relevant history about the condition. The most telling giveaways of the Mills image are the spatial relationships and physical features. A reputable scientific forensic analysis would have applied a grid system, mathematics, and spatial metrics. Such analysis would have identified the discrepancy in forehead, hairline, eyebrows, eye formation, and nose that is all too evidently wrong in the fake photo. In Plate 2, Gibson commits the authenticator’s crime of comparing one fake photo to another fake photo. She misidentified the comparison fake photo as being “Historically accepted group shot of Jesse James and cohorts, circa the 1880s.” Mills cites no recognized authorities for this false claim. A check of the clock informs the most unknowledgeable person that Bob Ford assassinated Jesse James in 1882. Jesse’s popular death photo reveals his physical features. They resemble the fake comparison photo, not in the least. Jesse, in fact, was a bit chubby when killed. A check of any Jesse James history book also tells us Jesse had no cohorts in the early 1880s, other than the despicable Ford brothers. Most egregiously, Gibson fails to discuss the physical discrepancies between her fake Jesse James and the fake comparison Jesse James. 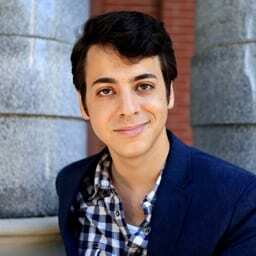 Between those two fake images, forehead, eyes, nose, ears, and facial width is all different. Here is the quintessential question everyone looks for in claimed pictures of Jesse James. 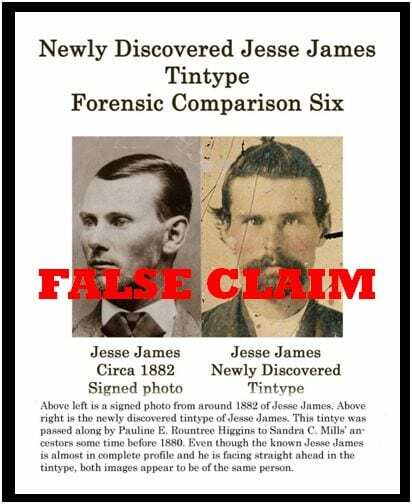 Where is Jesse’s famous missing fingertip in the comparison fake Jesse James? Mills’ fake Jesse James image displays a full set of unharmed digits. “Historically,” Gibson’s comparison fake Jesse photo was rejected already as a fake. The actual image exists in the collection of Robert G. McCubbin, a reputable collector of Western memorabilia. 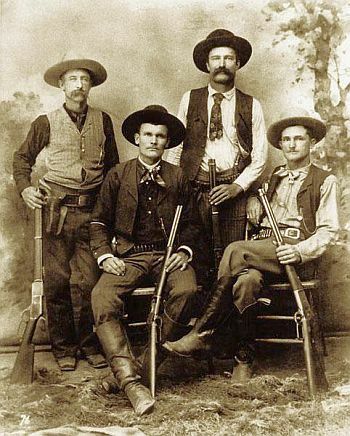 The photo is of a group of Texas Rangers, identified as (Standing, from left) Robert “Bob” Speaks and Jim Putman, (Seated, from left) Alonzo Van “Lon” Oden and John R. Hughes. The rangers were sent to Texas after a shootout in 1892. The image Los Gibson compared to Jesse James is an image of Texas Rangers produced in 1892, a decade after Jesse James was assassinated. The actual Rangers image is in the collection of renown western artifact collector Robert G. McCubbin, who is well known to the James family. The image also appears in the rotating banner on the website of the Texas Rangers Hall of Fame & Musem. The Rangers appearing in the 1892 image are (Standing, from left) Robert “Bob” Speaks and Jim Putman. (Seated, from left) Alonzo Van “Lon” Oden and John R. Hughes. The image of Lon Orden went to auction in 2002 when it was claimed to be Jesse James. At that time, Jesse’s great-grandson, Judge James R. Ross, lodged his written complaint with Swann Galleries in New York that was auctioning off the image. The image sold for a paltry sum to a man from Kentucky. I met that collector a few years later. The auction house had not informed him of the written opinion issued by Judge Ross. Proper and full disclosure might have influenced the bidder not to buy. Plate #3: Remember that shell game where three shells move around while you try to remember under which shell a pea was placed? Artist Gibson plays this game to fool the unsuspecting eye. She is not alone in deploying such tricks. We recently encountered the same technique by an auction house that was trying to sell a fake Jesse James image for an advertised $40,000 to $60,000 windfall expected. Some fool actually anteed up $12,000 for an image known publicly to be worthless. The price of ignorance in the Jesse James artifact market can be dear. While Gibson focuses the unsuspecting eye on her fake image, a knowledgeable eye is asking, “Where did this other fake image come from?” Gibson present a fake image of Jesse James never seen by anyone before. Neither Gibson or Mills cites no origination of this previously unknown image. No one among the Jesse James community ever has seen this second claimed image of Jesse James. Not ever among the Jesse James family. Certainly not among Jesse James historians. Not even among the public. Again, Gibson produces one fake image to compare against yet another fake image. The image she identifies as “Jesse James, 1870s, Webb City, Missouri” is another of Gibson’s gallery of Jesse James fake photos. In Plate 4o of Lois Gibson’s case, Gibson employs artistic skill to transform an authentic image of Bob Ford to match Sandy Mills’ claimed image. A scientific authentication of historic images requires no tampering with images, relying chiefly upon scientific comparison application to reach a conclusion about authenticity. In Plate #4, Gibson performs her same slight of the eye trickery. However, the physical features at the start of her slide characterization are not the same as at the end. If Gibson had simply looked at the photo of Bob Ford and his wife Dot Evans that appears on page 311 of my book, Jesse James Soul Liberty, Volume I, she might have surrendered her gambit to fool the Jesse James family. That photo of Bob Ford, never published before, has been in the possession of the James family for more than a century. That image of Bob Ford should have been integral to Mills’ authentication, had she tried. Plate #6: Incredibly, stunningly, and arrogantly, Gibson no longer can control her hoax. She goes full-bore con game. Lois Gibson not only introduces a third, previously unknown, and additional fake image of Jesse James, Gibson throws in a fake image of Zee Mimms-James, Jesse’s wife, to boot. To the trained eye, this third Jesse looks nothing like Gibson’s other two fake Jesse James photos. Nor does it compare to any known and authenticated historical image of Jesse and his wife. 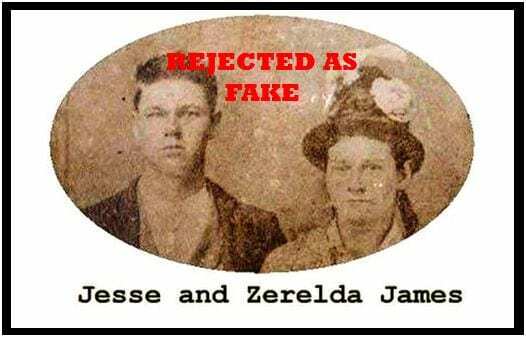 Plate 6 of lois Gibson’s case presents a 4th fake image of Jesse James, and adds a fake image of Jesse’s wife, Zee Mimms-James, to boot. At this point, Gibson loses all objectivity. She clearly has no knowledge of James family genealogy. Nor has she made an effort to know it. Jesse’s wife Zee is, in fact, a James family descendant herself. Zee’s mother is Mary James, Jesse’s aunt. The couple is first cousins. They share the same genetic DNA that marks their physical appearances with shared identical physical features. Those physical features have been accounted and quantified across five generations of the James family. In physical appearance, Gibson’s fake Jesse James couple share no common physical features that match the proven genetics of the James. HOW CAN THIS HOAX GO SO WRONG? The simple answer is environment and enablers, whether actual conspirators or not Texas is home to nefarious con artists who have preyed upon the Jesse James family and its identity for generations. From Orvis Hauk, to J. Frank Dalton, to Betty Dorsett Duke, Texans lift up their tall tales as they throw factual history into the trash. Texas legislators actually do this with schoolbooks, too. The true Jesse James family in Texas goes unrecognized. Around Granbury, authentic members of the real Jesse James family who live there roam in confident privacy and anonymity. They can do this because Granbury would rather fete its fake Jesse James internment there. Authentic Jesse James family members populate Texas terrain and cemeteries from Red River to the gulf coast. No Texan celebrates Geneva James who taught Willie Nelson in grammar school in Waco. Nobody in Johnson County knows of John James of Alvarado unless they follow Stray Leaves or read my book. Texas has yet to recognize the kinship shared between Houston’s George W. Bush and the Jesse James family. But Lois Gibson and Sandy Mills can find ample news coverage for fake Jesse James photos by the Houston Chronicle, whom we now must acknowledge as an enabler of bogus Jesse James imagery, along with their correspondent Dylan Baddour who broke the story. What motivated Baddour to inquire of an auction house and not of reputable Jesse James family, historians, or authorities? When it comes to Jesse James artifacts, we repeatedly take auction houses to the woodshed for their inflated and inaccurate claims, not to mention their despicable practices of deceit. In all of Jesse James auction history, there has been only one auction that performed ethically and responsibly; and, ironically, Heritage Auctions is in Texas. Arden Dier, who may or may not be a real person, also promoted the hoax by republication. Arden Dier harvested the story for republication for Newser, whose slogan is “Read less. Know more.” Really? We found no contact information for Arden Dier. Michael Pearson of CNN was suspicious of the hoax. The only reporter we found to question the Mills-Gibson story was Michael Pearson of CNN, for whom we also found no contact information other than his LinkedIn page. Skeptically, Pearson asked, “Does photo show outlaw Jesse James with his killer?” Talk about a slick, Texas slide step. There is more to this hoax than is clear at this moment. New information is being researched and developed. More revelations will come. In the end, this hoax will enter history under the names of Sandy Mills and Lois Gibson. No matter how long it takes, history always gets to the truth. Sandy Mills and Lois Gibson will stay on our watch list of tricksters, con artists, and frauds for some time. The family of Frank and Jesse James maintains the fraudulent actions of Dylan Baddour and Lois Gibson, and their sycophants engage in identity theft. A like reaction will probably come from the family of bluesman Robert Johnson. Music historian Bruce Conforth, identified in the Texas Monthly article has been friends with Johnson’s descendants. Conforth publicly acknowledges the Johnson family’s assessments that Gibson’s claimed Johnson photo, like the Bob Ford/Jesse James claimed image, is a fake. 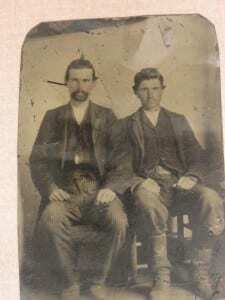 Claimed photo of Bob Ford and Jesse James is proved as a hoax. The article above is a re-publication of a post to Leaves of Gas that first appeared on October 2, 2015. 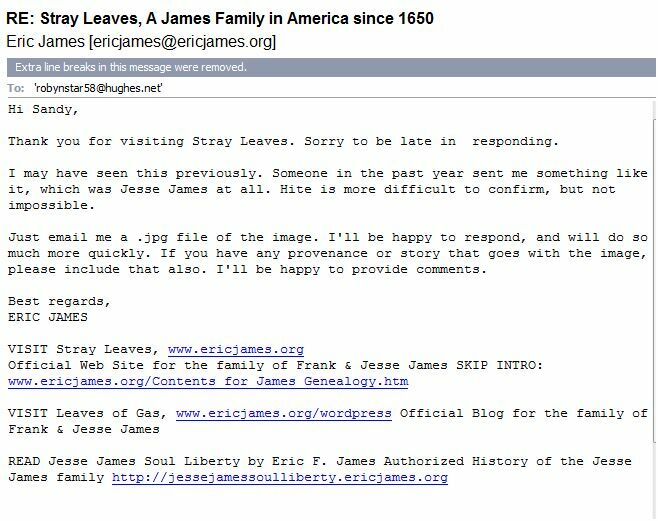 After the initial publication of “Lost Jesse James/Bob Ford Photo – Not Lost, Not Authenticated,” the Leaves of Gas blog was hacked. 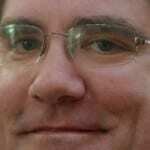 The hack occurred on the day on which the Houston Chronicle published an addition to the story. The hack prevented public access to this post when the Chronicle’s new article was being published. This post represents the James family’s rebuttal to the falsehoods presented in the Chronicle story. 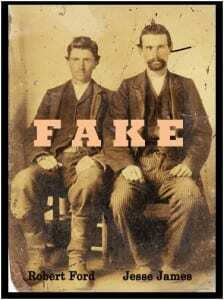 Moreover, the hack appeared to have emanated from Houston, Texas, the home base of this Bob Ford/Jesse James photo hoax.